When my daughter’s five-year-old friend asked if we were having a garage sale, I knew I hadn’t yet achieved the outdoor-living-room look I was going for. It was time for me to pull it all together; my eclectic look wasn’t working. It was evident that I finally reached my goal this past summer by the amount of time we spent in our outdoor living room. My husband came home almost every night and worked on his laptop from the outdoor sofa. We dined outdoors, weather permitting, most summer nights, which was great with my 15-month-old son — less mess. 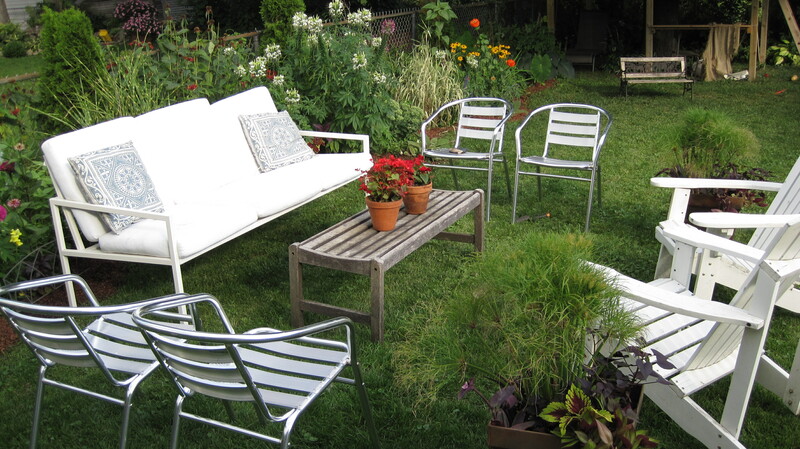 Having a comfortable, beautiful outdoor space is an asset to your home and quality of life. My outdoor living room is still a work in progress, but here are some tips I hope will help you create yours. My number-one goal for my outdoor living room is comfort. I want it to be a go-to place. So I invested in a comfortable, good-looking outdoor sofa and pillows with great outdoor fabric. I bought outdoor pillows from Restoration Hardware 9 years ago, and I leave them out in the rain and they still look sharp. I bought white, wood Adirondack chairs from Cub Foods years ago for less then $20 each; yes, the pillows cost more than the chairs. The outdoor sofa and cushions were from West Elm, but many stores carry a version, so there is one available at every price point. To get a cohesive look this past summer, I took the garage-sale table, Craig’s List table and hand-me-down table and covered them with layers of burlap. This is a fun choice because it is a neutral color and blends in with nature. It can stay out through all weather and still look great, and it is cheap, cheap, cheap. I love using burlap as an outdoor fabric. I also purchased some fabulous sunbrella fabric, yellow-and-creamy-white-striped. I used this fabric to make curtains for our mudroom but have found it also makes great tablecloths, and I plan to make more outdoor pillows with the sunbrella fabric. I have not mastered this myself but enjoyed one of my friend’s gardens last summer at a night-time party. She definitely mastered just the right amount of lighting by placing garden lights every 5-6 feet and then having traditional strings of lights hanging above. It was remarkably beautiful and not too much. I learned the most fabulous tip during our annual movie night for our block. It was especially buggy, and a neighbor suggested we put out a fan. She ran home and got a fan, and it was amazing. It totally kept the air moving and the mosquitoes off of us and our outdoor-living-room area. So for an organic, deet-free mosquito repellant, plug in a fan outside. Of course nothing beats hanging out on your comfy couch surrounded by beautiful flowers that smell great and attract fun birds and hummingbirds and monarch butterflies to watch for entertainment. My outdoor living room is still a work in progress, but it is a comfortable and entertaining place to hang.